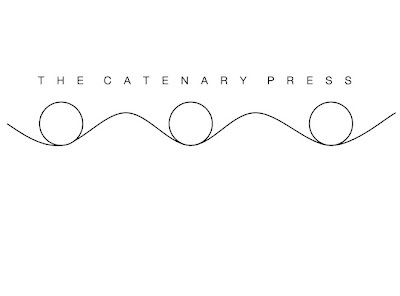 Founded in 2009, The Catenary Press is based in Iowa City and Walla Walla, WA. Recent and forthcoming titles by: Elisabeth Benjamin, Jennifer Moxley, Alice Notley, Hannah Sanghee Park, Margaret Ross, Robyn Schiff, and Heather Tone. Our chapbooks have been reviewed in Boston Review and The Kenyon Review. Daniel Poppick’s poems have recently appeared in BOMB, jubilat, Denver Quarterly, Colorado Review, OmniVerse, and elsewhere. A chapbook is forthcoming from Petri Press. He lives and works in Iowa City. Rob Schlegel is the author of The Lesser Fields (Center for Literary Publishing, 2009), and January Machine (forthcoming from Four Way Books in 2014). He teaches creative writing and literature at Whitman College. 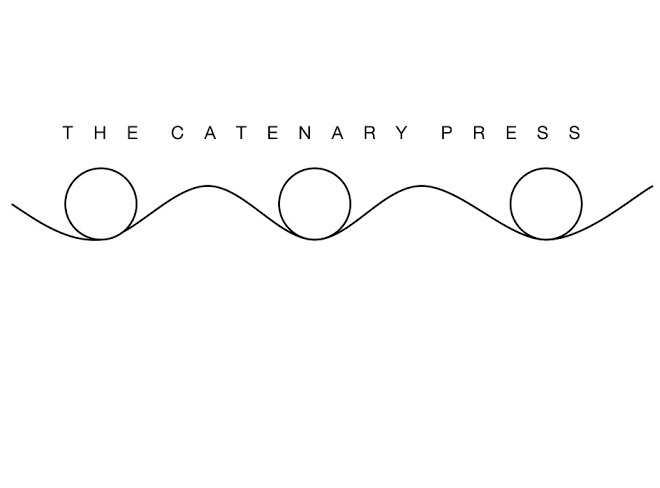 1 – When did The Catenary Press first start? How have your original goals as a publisher shifted since you started, if at all? And what have you learned through the process? ROB: I started the press with my wife, Kisha Lewellyn Schlegel, in 2009. In 2010, Dan Poppick agreed to become co-editor. Dan’s enthusiasm and editorial vision has been paramount to the press’s evolution. Our original goal was to publish long sequences in handmade, artist quality chapbooks. Most journals seem to publish only one or two poems by any given poet, which makes it difficult for a reader to get a sense for what the poet is really up to. Better, we thought, to celebrate the long sequence, the mind in the act of unfolding, while also providing readers with an extended example of an individual writer’s work. DAN: It began with an itch to read and talk about contemporary poetry as dynamically as possible and it's probably still that. Hopefully every new chapbook we publish subtly changes the nature of the space the press creates; I have faith in the Rube Goldberg machine that brought us from the epistolary gift-architecture of the prose poems in Elisabeth Benjamin's The Houses to Alice Notley's visionary, lyric re-coding of the "relationark" (her word, now everyone's) in Secret I D, which is forthcoming. Constellating different kinds of art makes for a more versatile machine. As we go on, The Houses looks more and more like an appropriate lodestar—we want to make a gathering space. And obviously we want to be challenged. ROB: It seems to me that the best small publishers cater only to their own tastes, prioritizing the strength and originality of the work itself over any other potentially threatening exterior influences. Unfortunately, a lot of larger publishers are often slaves to sales, public popularity, and opinion. DAN: Anything novel that we're doing as a press comes from the poets (and our cover designer, Rawaan Alkhatib). Elisabeth Benjamin, Hannah Sanghee Park, and Margaret Ross all let us debut their work, for which we remain grateful because it's totally singular; I mean no one in American poetry is writing like Margaret Ross. The same could be said of Jennifer Moxley or Robyn Schiff, any of the poets we’ve published. ROB: We pay attention to two things: poet’s work, and the materials and production of the actual chapbook (as a physical object). We publish poetry we love. And we try to reciprocate that love in the time and effort we put into the physical production of the chapbooks. By prioritizing these over everything else, we know we’re honouring the poet and her work, which is all any publisher should strive for anyway. Reviews on websites like the Boston Review and the Kenyon Review have been helpful in spreading the word, but most of the sales, can likely be attributed to word of mouth—friends of friends literally talking to one another about our poets in our communities and beyond. DAN: We spend a lot of time searching for the right work and figuring out how to arrange it, but then we usually leave it alone. Occasionally we'll do little structural experiments and reconfigurations with individual poems, but always with the poet. ROB: Our books can be purchased on our blog: http://thecatenarypress.blogspot.com/, and at one of the country’s best independent bookstores, Prairie Lights in Iowa City. They are also available at Berl’s Brooklyn Poetry Shop. DAN: We couldn't do what we do without Rawaan, as Rob mentioned—or Vincent Peiffer, our intern, who seems to know everything about string, for one example. We need that. Both of them have been incredibly generous with their time and talents. And I can't really imagine doing this without Rob, who had the original vision anyway. We talk each other into things and destabilize each other's impulses, which is all good, but three years in I'm terribly gullible when he makes "jokes," like a few weeks ago when he told me he was going to start writing for Men's Health. Turns out this is false. Rob is omniplausible. ROB: We are always thinking about how another writer’s music/process/habits might influence our own. In this way, Elisabeth Benjamin influences the way we think about compressing explosive narrative into smaller and smaller fragments; Jennifer Moxley enhances our understanding of how to use and subvert what might be considered “classical” subject matter; Alice Notley gets us thinking about our own private relationship to the muse, while also challenging our notions of where the individual lyric fits into a longer, serial work; Hannah Sanghee Park’s formal inventions (unlike anything anywhere) reveal the fertile ground where form and content blossom; Margaret Ross’s and Robyn Schiff’s long, meticulous lyrics inspire us to pay more careful attention to how we actually LIVE in the world with other HUMAN BEINGS; Heather Tone’s sequences reinforce for us how repetition and metaphor contribute to verisimilitude of a singular and shared experience. DAN: I think it's pretty much irrelevant. I doubt we would do it at this point, but only because there are too many other poets we want to work with instead. 11– How do you see The Catenary Press evolving? ROB: We set out wanting to publish the best long poems and sequences we could find, and I think we’ve succeeded in doing so. We have talked about possibly anthologizing these first seven chapbooks into one anthology, which I think could function as a significant marker of this rich moment in contemporary poetry. DAN: If this poetry finds a readership it wouldn't have otherwise and we've made a solid, beautiful vessel for it, then we've done our job. Rob has already sort of mentioned this, but I like that we’ve become for really ambitious lyric poetry in particular, poetry that sometimes gets overlooked elsewhere because it’s “difficult,” but we’re not the only press doing that. Anything else that happens comes from the poets. And like just about everyone and everything else right now, we're working with a tight budget, so no gold-leaf editions for us, sadly, not right now, though there's always the internet. ROB: I still think of us as “starting out,” and hope to always think of us as that way. That said, some important models have been Bateau, Effing Press, Ugly Duckling, Cannibal, The Pines. 14– How does The Catenary Press work to engage with your immediate literary community, and community at large? What journals or presses do you see The Catenary Press in dialogue with? How important do you see those dialogues, those conversations? DAN: It's been said a thousand times, but of course poetry is a conversation. Iowa City is thick with it, and some of my favorite presses and journals have hatched next door, sometimes literally. When Rob and I were getting started on Catenary I was sharing an old house with Jeff Nagy and Eric Linsker, who were at that time starting The Claudius App, which is among my favorite poetry journals in America right now. Our sensibilities diverge wildly, but what they're doing is so lushly ambitious and problematic in (I think) the best ways. They raise the bar, or perhaps sledgehammer it. The same could be said for Song Cave and Canarium Books, both of which also have roots in Iowa City. We overlap with them (Robyn is an editor at Canarium, Jennifer has a chapbook with Song Cave), but what we do is obviously different. I don't know that sewing chapbooks is a conversation. The poetry is the dialogue. ROB: Public readings function as a kind of celebratory “coming out” party for the work itself. We’ve had a few book launches/readings at Prairie Lights in Iowa City, and one in Boston last year. With Dikembe Press, we’re planning another reading for late February/early March (2014) in Seattle. DAN: At this point the internet is more or less half of our worldly existence, so it isn't so much a matter of furthering goals as furthering reality. This is like asking "How do you use language to further your goals?" That said, we're only in print, so it's a good question. "How do you use language to further your goals?" would also be one. ROB: We’re very excited about forthcoming chapbooks by Alice Notley and Heather Tone. DAN: It’s difficult to talk about the work of a poet who abjures idol worship as fiercely and gracefully as Alice Notley, but in the spirit of answering the question without bullshitting around I think she’s one of the great American writers of the last fifty years, even as she works from abroad. She’s inimitable—as poets, all we can do with her influence is walk through the door she’s kicked open. Secret I D speaks honestly to this moment of unprecedented surveillance and all of its ontological and spiritual quandaries while tinkering the English language into new slang so that maybe we can actually talk to one another from inside the panopticon. In a sense it’s a new cold war poetry in which the poet is a spy for and of everything, a spy inside relation itself, even “a spy in the afterlife.” At one point in a poem called “Tell Me the Language,” she claims “I write for those who don’t read my poems.” This seems earnest to me, and it speaks to what one might hope for in really ambitious art. Book by book, sequence by sequence, poem by poem, I think Alice’s corpus radicalizes the self and whatever reality it touches with kindness and violence in equal measure. In this sense she has been writing one book her whole career, and Secret I D is the next word in it.